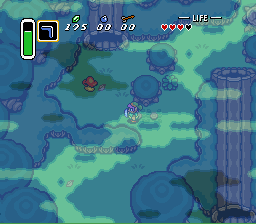 Northwestern Hyrule is heavily wooded. It is dark and dreary, so few people venture in, but those who do often fall victim to thieves. An old legend retold by the village elders claims that the Master Sword lies waiting in the woods for one who is worthy of it. For as long as most Hyruleans can recall, a dark mist has cloaked the Lost Woods. Thieves found it a fitting place to hide out, but aside from them, the woods are home to animals only. People seeking Mushrooms for medicinal potions sometimes dare to enter, but they don't stay long. Some even report finding swords in the woods. A Fortune Teller lives in a quaint cottage near one entrance to the Lost Woods. For a price, he will stare deep into his crystal ball to predict the futures of travelers who stop in. Some people took his predictions seriously and visited him regularly, but others felt that they had wasted their time and money and vowed never to return. Two lone Lumberjacks live in the north. They logged close to their home until the mist rose from the forest, then the two apparently went to fell trees in other forested regions. One day as they were beginning to saw down a tree near their home, the Lumberjacks remarked that something seemed odd about it. They left it standing, and some time later, you can discover the mystery behind the tree. The forest thieves operate a game of chance that was nothing short of highway robbery. For 100 Rupees, travelers could open a trunk and take the contents, but usually they were taken for a ride because the trunk often held a single Rupee. Smart gamblers pass on this game. There are more profitable bets to be made elsewhere. However, if you are struck with the slightest amount of luck, you could end up with a 300 Rupee jackpot! 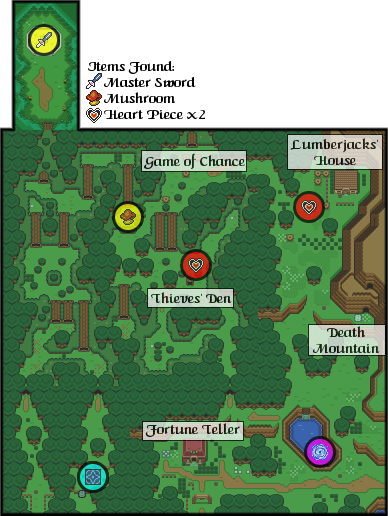 Hyrulean thieves base their headquarters deep within the Lost Woods. The Lost Woods thieves were craftsmen of sorts. They use trees and bushes to camouflage its entrance, and they prey on any luckless souls who happen to wander into the woods, taking their Rupees, their Arrows, and even their Bombs. When the thieves are on a rampage, the forest is a dangerous place. Intrepid adventurers who fully explore the thieves' domain may even discover a precious Piece of Heart among the hidden treasures of their den. Searchers uncovered a glimmering tile north of Kakariko. Its origin was a mystery, and parents warned their children not to play near the tile after one child stepped onto it and instantly disappeared, never to be seen again. Death Mountain towers over north Hyrule, a challenging climb for even the most experienced mountaineers. 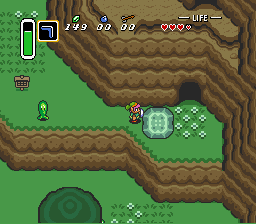 A huge stone blocks the entrance to Death Mountain's tunnels. Only a very powerful person can move it. To reach the summit, climbers traversed a series of tunnels that form a dark, Keese-infested maze. Many travelers told stories about an old man who lived comfortably in a snug cave on Death Mountain. He always offered them refreshments and sometimes even handed his possessions over to people in need. Few attempt the trek. According to Hylian legend, when the people began to suspect that the Triforce's power had fallen into the wrong hands, they forged a massive sword that was resistant to evil magic. The Hylians used fine steel to forge the massive blade of the Master Sword, and they adorned the hilt with gold and rare jewels. It was a mighty weapon that only someone brave, honest and strong could wield. They embedded the blade in a stone monument deep within the Lost Woods, then awaited the day that a worthy warrior would come to claim it. According to the legend, only the true hero, the chosen one, could earn the three Pendants and remove the sword from the stone. An ancient Hylian message was inscribed on the stone monument that holds the Master Sword. Only one well-versed in Mudoran will be able to translate the script. Decoy swords are also hidden in the woods. They fooled some, but paled in comparison to the real thing. In the Lost Woods, you will find a giant Mushroom that smells like sweet, rotten fruit. There's something magical about it, something valuable. Keep it until you find the Witch who lives north of the Eastern Palace. With the Mushroom, she will make you something special. In the mean time, travel south to your destination in Kakariko Village, in search of the elder Sahasrahla. This page was last edited on 28 February 2013, at 19:52.